Reno is always silent, even during the day. The casinos are airtight edifices, carpeted inside, and no noise spreads beyond the rooms where the slot machines and the gaming tables stand in serried ranks. You can’t even hear the traffic on the busiest road, Virginia Street, or on the freeways that cross the city, the I-80 and Route 395, as if they, too, were carpeted or as if the cars and trucks were moving very stealthily. This observation reflects a city tucked within a desolate landscape — there’s no cricketsong in Reno at night and not much birdsong during the day — but this opening is also a foreshadowing of the tone and pacing of the book. In one of several letters to his friend L., Atxaga reports, “Looking at those mountains—far, far, far away, so far that the most distant ones looked like mere maquettes — I was keenly aware of the world’s utter indifference to us. This wasn’t just an idea either, but something more physical, more emotional, which troubled me and made me feel like crying.” Driving through Nevada, you could go a long time without seeing new scenery, and certainly without encountering breathtaking views — unless the sheer expanse would take your breath away — so it’s fitting that the book’s sublimity lies in its setting rather than its plot arc. 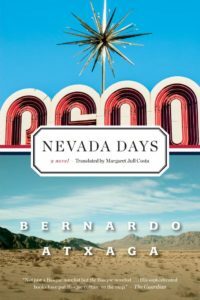 A Kirkus reviewer failed to take the book on its own merits when that critic surmised that “Atxaga has taken in a lot about the peculiarities of desert living, but he’s only half-heartedly attempted to deliver a full-bodied work of fiction about it.” Nevada Days doesn’t match up to plot-driven works of fiction — despite its sub-plot of sexual assault and murder — because that’s not the kind of fiction Atxaga has written. It’s a subdued book about place, rendering Nevada as its central subject. Nevada Days reminds me of Sara Orne Jewett’s The Country of the Pointed Firs, a nineteenth century novel depicting the fictional Dunnet Landing, Maine, wherein nothing extraordinary happens. There’s no central conflict, no main character. Instead, the narrator, who is a writer and outsider just like Atxaga’s narrator, spends the summer learning about and documenting the history and legends of that small coastal community. The Country of the Pointed Firs delivers a series of character sketches and documentation of stand-alone interactions with the townspeople. Nevada Days likewise wanders as a visitor would, one who’d been welcomed in by the region’s inhabitants. Atxaga gives us snippets, history, and mythology of the Basque community as well as embellished reportage of his sojourn in the Western U.S. Though subtitled “a novel,” Nevada Days reads like memoir. The book begins with a series of short vignettes — sometimes no more than a paragraph long — as the family settles into a house not far from the University of Nevada Reno campus. Atxaga, his wife and their two children meet the constellation of characters that revolve around the Center for Basque Studies. There’s Bob Earle, a retired professor who donated the writer-in-residence house to the university and takes Bernardo on a series of trips into the desert, Mary Lore, who hosts dinner parties that introduce the Atxagas to the wider community, and Dennis the IT guy, who keeps a black widow in a jar in his office as a kind of experiment. Once settled, Atxaga and his family begin to explore the surrounding areas: the Pyramid Lake Paiute Tribe’s Reservation, the Black Rock Desert where Burning Man is staged, historic Virginia City, Lake Tahoe, and the ghost town Berlin. As the family’s explorations cover more ground, the chapters also expand and build to more substantial stories, such as the twenty-page series of chapters on the early 1900s Basque boxer Paulino Uzcudun. The writer’s imagination expands alongside the chapters; memory and daydream blend. Twenty pages in, “A Drive in the Desert” is the first major departure from the short chapter and it departs in two ways: first, Atxaga ventures into the desert with his neighbor: finding a stolen FedEx truck with a rattlesnake in the driver’s seat, walking around the ghost town of Berlin, seeing a prison work crew on the side of the road. Second, Bernardo’s fantasies begin to appear. He recounts that when Bob Earle was moving the rattlesnake, it dropped onto the hood of the FedEx truck and started toward him, then he reverses course, saying he made that detail up: Earle successfully relocated the snake to the bushes. As another example of Atxaga’s imagination, between the first and second encounter with the prison gang, Bernardo relays a conversation between two inmates he imagines will jump them on their way back. If readers are looking for a clear plot and a dramatic arc, they’re likely to be disappointed. This is a book for readers looking for skillful writing with character and place very much at its center. Here, background is foreground, which means that the Nevada landscape and quotidian interactions are recurring themes — not because Atxaga fails to create a “full-bodied work of fiction,” but because this book is a travelogue which seeks to depict a region and its people. Laura Wetherington‘s first book, A Map Predetermined and Chance (Fence Books), was selected by C.S. Giscombe for the National Poetry Series. She has a chapbook just out from Bateau Press, chosen by Arielle Greenberg for the Keel Hybrid Competition. Laura teaches in Sierra Nevada College’s low-residency MFA program.